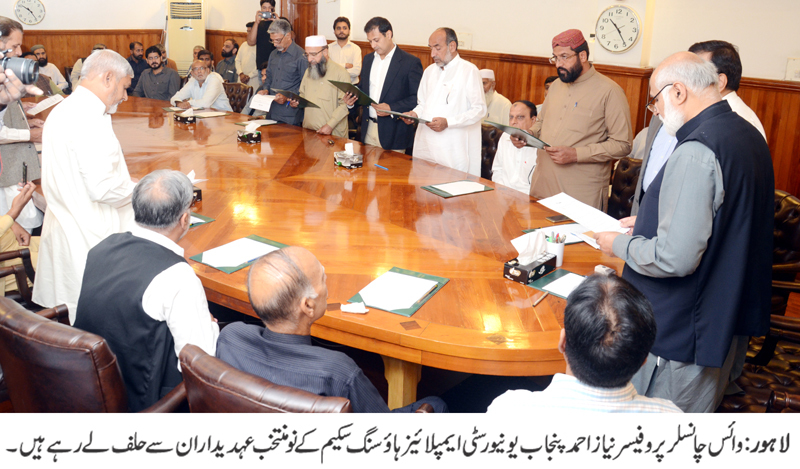 LAHORE: (Thursday, October 11, 2018): Punjab University Employees Housing Society’s newly elected office bearers have taken oath from PU Vice Chancellor Prof Niaz Ahmad at committee room of his office here on Thursday. 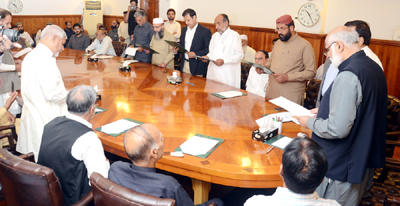 PUEHS’s newly elected President Munir Awan, Vice President Shahbaz Ali, General Secretary Muhammad Arshad, Joint Secretary Hafiz Iftikhar Hussain Awan, Executives Members Muhammad Alam, Abdul Jabbar, Muhammad Asif Khan, Muhammad Riaz, Muhammad Nadeen Munir Choudhary and others were present on the occasion. The VC congratulated the newly elected office bearers and advised them to work hard for resolving issues of the community.